One Chicken: Two, Maybe Three Meals!! – Butter, Baking, and Bacon! One Chicken: Two, Maybe Three Meals!! The finished herb butter ready to rub on the bird! In a small bowl, combine the seasonings with the softened butter. This will be called THE HERB BUTTER from here on out. 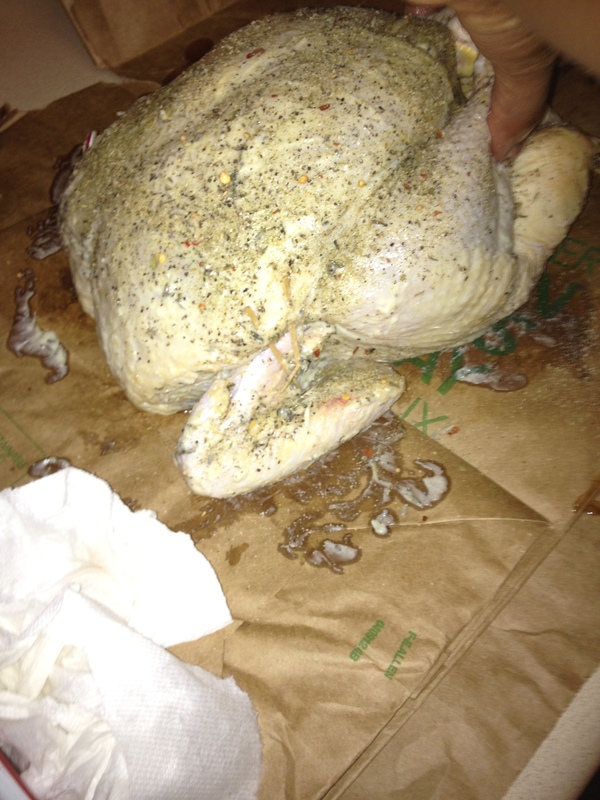 Pat the chicken dry and season the inside liberally with salt and black pepper. 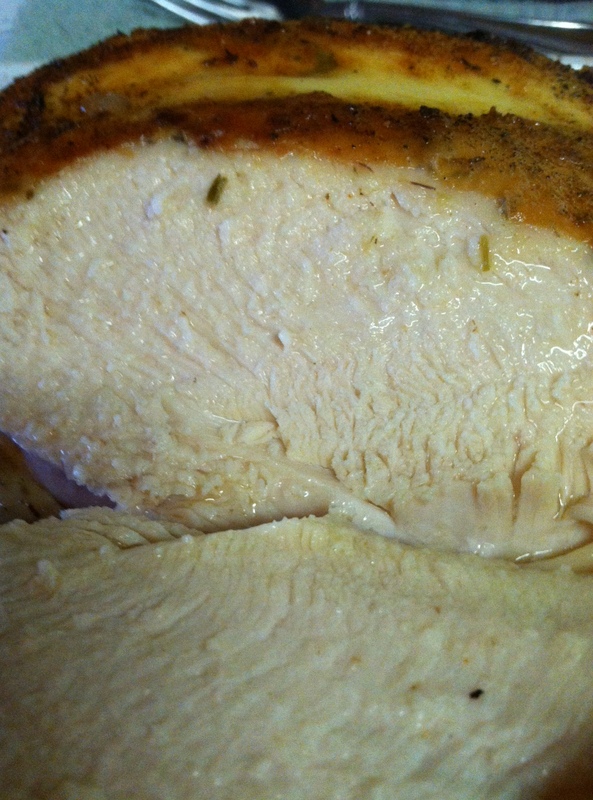 Rub a small amount of the herb butter under the skin, DIRECTLY on the chicken breasts. Rub the entire chicken with the remainder of the herb butter. Pour the chicken stock or wine on the bottom of your roasting pan. Place chicken breast side up in pan. Roast in preheated oven at 425 degrees for 15 minutes. Reduce heat to 375 degrees and roast for another 45-50 minutes or until the meat thermometer reads 180 degrees in the thick part of the thigh. The drumstick should move about freely when wiggled. The juices of the chicken run clear upon inserting a skewer into the leg. 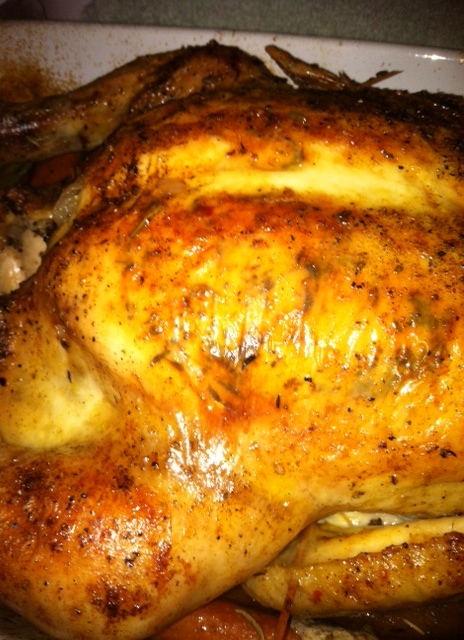 Remove from oven and allow to rest for 10-15 minutes to allow juices to redistribute and settle. This is really important. 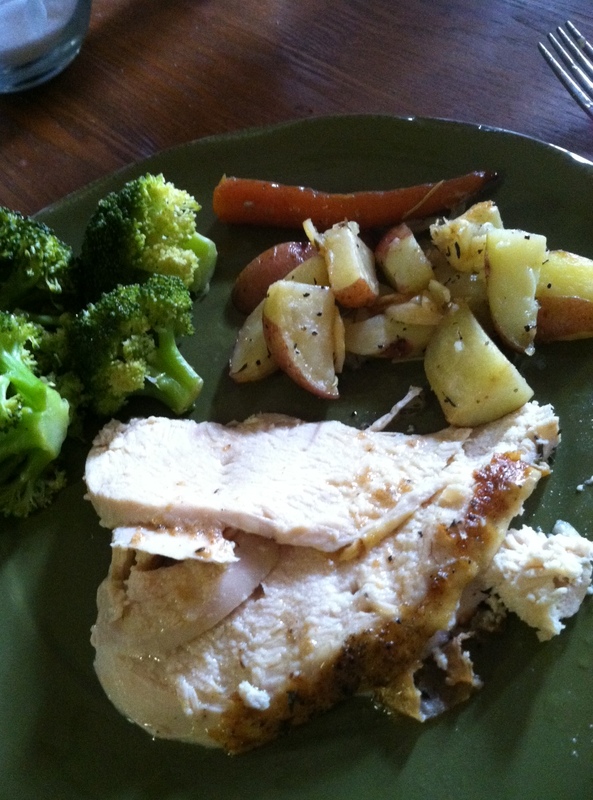 Slow down, you won’t starve and the juicy chicken will be well worth it! 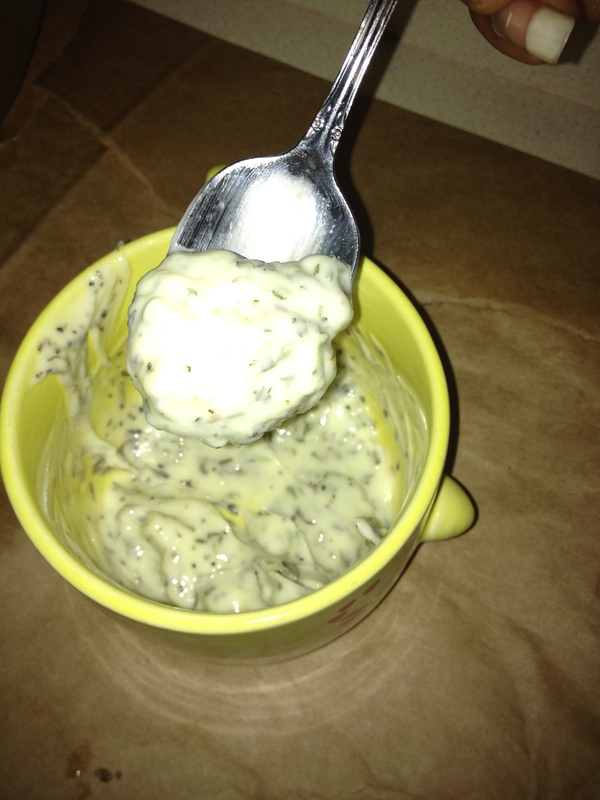 Lemon Butter Sauce: Combine the butter, lemon rind, onions and lemon juice. Simmer over low heat for 3-5 minutes. Mix well and add in the parsley. Spoon a small amount of sauce over each piece of chicken when served. One slice and the juices run! Place chicken, celery, onion, bay leaves, and cheese in stock and cook at a low boil for 20 to 30 minutes, until meat begins to fall off the bones. Remove bay leaves. Add cream soup, rosemary, and sage to chicken and continue to boil. If desired, you can thicken the stock at little by mixing 2 tablespoons cornstarch with 1/4 cup of water and adding it to the stock. Drop the frozen dumplings into boiling stock. Never stir dumplings. Shake the pot gently in a circular motion to submerge dumplings in stock. Cook until the dumplings float and are no longer doughy, 3 to 4 minutes. Do not over cook. Serve with cornbread or garlic bread! Previous Post A Simple, Yet Tasty Beef Stir-Fry! Next Post Belgian Waffle Morning! this is simply great test by just looking the picture. Wow…i think this dish will be delicious and attractive..
Amazing dish. will try it. Wow looks yummy..superb photos..will definitely try it..
really, I am very Hungry……! That looks pretty good, im trying it for sure! The dish looks really very yummy!! What a wonderful dish.I feel very hungry to eat it.I surely try this in my home. These look like real tasty recipies. could you put serving sizes and calorie counts at the end. You could use really small type, but the dieters in the midst would apprecieate the support. wow itz just superb…i made it..jus tasty!!!! wow..!! excellent recipes..!! The images adds to the excitement.. very tempting to eat.. will surely try out these recipes.. Thanks for the post..
Yummy…I Like this dish..I want to eat it..
Looks good…. Love to eat this dish !!!! Very Super and tastie dish…i am really need this dish to eat……. Oh my God,my mouth already started to water……….. Delicious and ready to eat. I could not decide which part to bite first!